This field type is also new to 2.1.0. Before that, you had to collect phone numbers either in a single field in your form, or by splitting them onto multiple lines. This was a pain. So, 2.1.0 introduced a customizable phone number format. 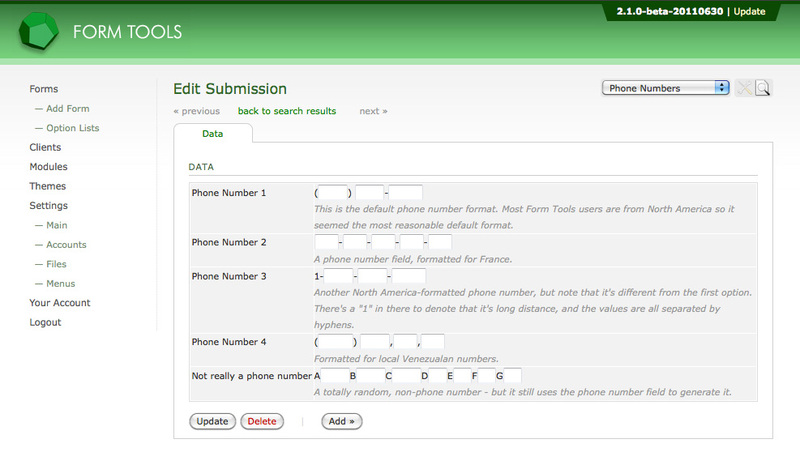 It can be used to gather phone numbers in any format - regardless of country. In fact, it's so generic, you can actually use it to create strings of textboxes on a single line to store anything you want. But calling it the "Phone Number" field will probably cover the most common usage. Take a glance at the screenshot to the right. That contains a number of examples of how you can use the field. Cool, huh? It's really quite versatile: you can use it to store phone number in any format - and it's very easy to learn how. Let's look at the Edit Field dialog to see the options are and how you customize the format. As with the other field types, to see the available settings for this field type, go to the Edit Form » Fields tab, click the Edit icon (the penultimate column) and go to the second tab in the dialog window that appears. Phone Number Format: this is where the magic happens! All you need to know is any "x" character you enter in here will be converted into an input field and all other characters are outputted as-is. If you have multiple x's in a row, a single textbox will be output, but with the size and maxlength to allow that number of characters. That's it! Very simple, but very powerful. Field Comments: this lets you add a comment underneath the field, in case it needs a little explanation.